We’re still in the process of organizing and verifying these links. If you find any that do not work, please consider letting us know by using our Contact page. Note: All links open a new window or tab in your browser. CHORALNET, in English: [www.choralnet.org]; probably the largest choral website, with links to many resources, a database of music, and an elist (ChoraList, see E-Lists list below). LAMC-L (Latin American Music Center, Indiana University, Bloomington, IN, USA): [www.music.indiana.edu/som/lamc]. Administrator Erick Carballo . News, articles, events, music collection (scores, literature, recordings, etc. ), links. ILM (Iberian and Latin American Music, Royal Holloway University, London, UK: [www.sun.rhbnc.ac.uk/~vhwm002/ILM/]. Scholarly e-list, and many links to scholarly resources. Camerata ad Libitum: [www.camerata.es]>. In Spanish and English. Site has a news, links, articles, downloadable scores of unaccompanied choral, “shop” for scores; art music from Renaissance to contemporary, European and Latin American (PDF). Director, Julio Dominguez. International Association for the Study of Popular Music (Latin American section): [www.iaspm.net]; lists their members and their email addresses, links to other organizations, archives, catalogs, e-journals, centers, and institutions. The Living Composers Project: [http://composers21.com]. Biographies and c.v.’s of living composers; all information verified by the composers themselves. Classical Archives: [www.classicalarchives.com]. Information about composers, audio clips of compositions, etc; information is not verified. CHORALIST: [www.choralnet.org]; monitored lists in English with separate lists for informal discussion (Choral Talk), notices and questions (ChoraList), and scholarly discussion (Choral Academe). MUSICACORAL: [http://ar.groups.yahoo.com/group/musicacoral/]; in Spanish; sends Boletín Música Coral, an e-journal with calendar of events, courses, festivals, links to choirs (etc.). Creator/administrator Tulio Pablo Fiorentino [tuliofiorentino@interar.com.ar]. FMLA (Foro de Música de Latino-Americana) [www.choralnet.org/fmcl/] [ornajela@adinet.com.uy]; in Spanish, based in Uruguay; [adinet.com.uy@mail.adinet.com.uy]. LAMC-L (Latin American Music Center List, Indiana University, Bloomington, IN, USA): [www.music.indiana.edu/som/lamc/research/lamc-l/index.html]; in English, Spanish and Portuguese with translations from and to these languages. Administrator Erick Carballo [carballo@indiana.edu]. Asociación Argentina para la Música Coral (AAMCANT): [www.aamcant.org.ar]. The site hosts a large list of conductors and choirs in Latin America and elsewhere. Federación Coral del Caribe y Centroamérica: [www.hometown.aol.com/fedcocarcen/]. Includes Mexico, Guatemala, Venezuela, Costa Rica, Panamá, Cuba, Dominican Republic, Puerto Rico, Curazao, Bonaire, Martinica, Guadalupe, Belize, and Aruba. IFCM (International Federation for Choral Music): [www.ifcm.net] To log on, obtain a membership in the IFCM, give your membership number, and choose a password; moderator Jean-Claude Wilkens [jcwilkens@ifcm.net]. Blog de bibliographía y documentación musical: [http://bbdm. wordpress.com]. News, reviews, commentaries, etc., related to musical research; links to research libraries and institutes. Run by Leandro Donozo. In Spanish. Asociación Latinoamericana de Informática Musical (The ALIM-L ) has been merged with the list LAMC-L (Academic Discussion of Latin American Music, Indiana University’s Latin American Music Center). A description of the old list is still provided for your perusal. American Composers Forum (USA): [www.composersforum.org]. American Society of Composers, Authors and Publishers (ASCAP)(USA): [www.ascap.com/ascap.html]. Música colonia americana: [http://ar.geocities.com/arscontinuus]. Dir. Veronica Dalmasso. Promotes activities, festivals, concerts. The chorus ARS CONTINUUS has recorded a CD of this repertoire for the APAC (Asociación Pro-Arte y Cultura), an organization of the Festival Internacional de Música Renacentista y Barroca Americana “Misiones de Chiquitos” (October 2001). Also available are articles, reviews, manuals, research papers, documentation, and scores (under construction, contact Dalmasso [vmdalmasso@hotmail.com]). ChoirCD’s: [www.choircds.com]. Non-commercial choral recordings. Coros del Peru: [www.corosdelperu.cjb.net]. Fundación Coros del Perú, representatives Armando Vértiz Cayo, Odilia Bendezú Monge, Juan Carlos Cuadrado. Announcements, notices, calendar of events, directory, forum, etc. Colegio de Compositores Latinoamericanos de Música de Arte: [www.colegiocompositores-la.org]. List of members, some scores in PDF, articles, news, links, commentaries, and MP3 examples. Latin American Art Song Alliance: [www.laasa.org]. Allison Weiss, Director. Mundo Arts: [www.mundoarts.com]. Dedicating to helping Latin American composers and performers. Commissions and publishes Latin American art music. Runs the Barcelona Festival of Song (summer course on music in Spain & Latin America). MundoClasico: [www.Mundoclasica.com]. News about classical, traditional, popular music, and jazz; separate pages for various genres (choral, orchestra, etc.). Publishes e-periodical Revista Mundo Clásico. France: Academia Musical de Indias: [http://amusindias.online.fr/html] [amusinfo@online.fr]. A research institute based in France that publishes scores and scholarship about them (some are free); some sound files and scores are available on the website. Membership is required for full access. http://venus.unive.it/imla/>; imla@unive.it. Instituto para el estudio de la Música Latino Americana durante el período colonial. Director dott. Anibal E. Cetrangolo, Via Fuà 5, 35133 Padova, ITALIA. Tel. +39 (0)49 611684. The institutes mission: provide bios of Italian emigrants and their deciples to the Americas during the colonial era. To transcribe their scores from Latin American archives, and to provide commentary about their background and context of the music. To write a history of the influence of the Italian composers working in the Americas. To catalog the music, musicians, and composers. To provide scores, concerts, discographies, conferences, publications in print and electronically. Collaborator: Università Ca’ Foscari di Venezia. Recordings by the Ensemble Albalonga of Bs As, ARG. Some on-line publications. Many links. Arizona State University Center for Latin American Studies: [www.asu.edu/clas/latin/Faculty_Staff/Q_S.htm]. British Library, Hispanic Printed Collections (1501-1850): [www.bl.uk/collections/epc/]. Carnegie Mellon University (Pittsburgh, PA): [www.cmu.edu/cfa/music/cuarteto/]. Catholic University of America’s Latin American Center for Graduate Studies in Music (Washington, DC): [www.lamc.cua.edu]. There is a searchable online catalogue of composers, lists of resources, etc. Dartmouth University’s International Hispanic Study Group: [www.dartmouth.edu/~hispanic/]. Coordinator William Summers, Music. ugradbulletin/ucd/ucd_latinamericanstds.html]; program includes courses and a musical ensemble. Texas Christian University, Center for Latin American Music Studie: [www.tcu.edu]; Germán Gutiérrez, Dir. Tulane University, Stone Center for Latin American Studies: [http://stonecenter.tulane.edu/html/]. University of Arizona, Center for LA studies: [http://las.arizona.edu]. Music Professors: Richard Obregon, interests: Mexican folk music; mariachi; Tex-Mex indigenous music. Thomas Patterson, interests Brazilian music. Janet Sturman, interests: Hispanic music traditions, chiefly Caribbean, issues of ethnic and class identity. University of Chicago, Center for Latin American Studies: [http://clas.uchicago.edu/resources/music.html]; has a Latin American Music Collection; Ediciones Mexicanas de Música, with support from the U.S.-Mexico Fund for Culture, donated more than 180 scores to the collection, which concentrates on 20th century from Argentina, Brazil, Cuba, Chile, Guatemala, Mexico, Puerto Rico, Uruguay, and Venezuela; nearly 250 recordings; Department of Music contact Robert Kendrick. University of Connecticut, Center for Latin American Studies: [http://clacs.uconn.edu/afffaculty.html.] Robert Stephen, Ethnomosicology, Yoruba Culture, Cuba. University of Pittsburgh, Center for Latin American Studies: [www.ucis.pitt.edu/clas/]; has a good collection of books about Latin American Music; Dr. Leonora Saavedra, also Director of CENIDIM, Mexico. University of Texas (Austin), LANIC (Latin American Network Information Center): [www.lanic.utexas.edu]. Lists of music resources by country. Universidad Autónomo de México, Instituto de Investigaciones Estética, project CONACYT-PAPIIT: [http: www.musicat.unam.mex]. 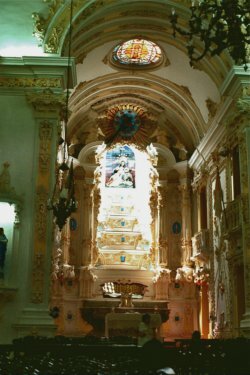 Includes a database of documents about music in the archives of the cathedrals of Puebla, México, Oaxaca, Morelia, Mérida, Guadalajara and San Cristóbal (1525-1858). RILM International Center: [www.rilm.org]: E-mail . International Index to Music Periodicals, Chadwyck-Healey: e-mail [info@il.proquest.com]. Music Index, Harmonie Park Press, 23630 Pinewood, Warren, Michigan 48091-4759. PHONE: (800) 422-4880 (Toll free U.S.); (586) 755-2560 (Outside U.S.). MUSICA: [www.musicanet.org]; searchable index of choral music worldwide; information about music and links to publishers and composers; must contribute money for extensive searching. HLAS (Handbook of Latin American Studies): [www.memory.loc.gov/hlas]. Annual, extensive bibliographies by subject. Latinoamérica Música: [www.latinoamerica-musica.net]. Non-profit, publishes articles about music and musical life in Latin America, with an emphasis on the art music of the 20th and 21st centuries. Andante Corp: [www.andante.com/Article/article.cfm?id=25170]. Site includes Magazine (news; book, CD, and concert reviews, opinions, essays); to subscribe, go to Camerata ad Libitum: [www.camerata.es] info on activities, scores, and CDs; order forms, secure; some free scores can be printed out or listened to before ordering. Julio Dominguez [camerata@teleline.es]. Biographies of Venezuelan composers: [www.venezuelatuya.com/biografias/]. Forma Antiqva/Portal de Música Barroca: [www.formaantiqva.com]. Gourmet Music and Musicology in Latin America : [www.gourmetmusical.com]. A site for “music and musicology” of Latin America. Databases in progress of recordings, persons (extensive), institutions, publishers, bibliography, discography, editors of music and periodicals. A miriad of links. Journal of Seventeenth Century Music (USA): [www.sscm.harvard.edu/jscm/welcom.html]. Multicultural music: [www.emory.edu/CANDLER/arts/multi.htm]. Marian Dolan’s multi-cultural resource lists and links to other sources. Sacred world music and world music publishers list: [www.asan.com/users/dweber/home.html]; web pages by Denise Weber, children’s choir director at Riverside Church, New York. The Western Wind Vocal Ensemble, Inc.: [www.westernwind.org]. Zarzuela [Spanish Opera] site: [www.nashwan.demon.co.uk]. Information, scores, and libretti. Ars Contemporanea: [www.arscontemporanea.8k.com/princes.htm]. Composers, etc., of Argentina. CENTRO PROVINCIAL DE DOCUMENTACION E INFORMACION…CONSERVATORIO DE MUSICA JULIAN AGUIRRE: [www.musicargentina.com]. The chief concern is tango. Directorio de Coros Argentinos: [www.corosargentinos.com.ar], [www.aamcant.org.ar/index2.html. Has a list of many Latin American composers. Fundación Takian Cay: [www.ijcv.com/takiankay]. Free bulletin, Utopias y realidades. Instituto Musicológico “Carlos Vega:” [www.inmuvega.gov.ar]. Música Clásica Argentina: [www.musicaclasicaargentina.com]; lists (with some links) of choirs, choral	conductors, composers; can buy books, music, and recordings published by Editorial Argentina de Compositores. Also an e-list for discussion. Contact information for conductors, choirs. Many links. Universidad de la Plata: [www@unlp.unlp.edu.ar]. Compositores & Intérpretes: [www.ciweb.com.ar]. Biographies, photos, and links to composers, performers, ensembles, critis, associations, musicologists. Universidad Autonoma “Juan Misael Saracho”: [www.uajms.edu.bo/Unidades/Deptos%5FDivs/Biblios/biblios.html]. Information about the library system of the University. Universidad Católica Boliviana, Servicio de Consultas Bibliograficas” [www.ucb.edu.bo/biblioteca/caratula.html]. Online library catalogue. Universidad Mayor de San Andrés library: [www.umsanet.edu.bo/org/biblio/]. Library website. Pontificia Universidad Católica de Valparaíso (Chile), Institute of Music Library: [http://biblioteca.ucv.cl/ udsist/bespecializadas/bmusica/index.html]. Revista Musical Chilena: [www.scielo.cl/scielo.php?script=sci_serial&lng=en&pid=0716-2790&nrm=iso]. Scholarly e-journal covering music in Latin America. University of Chile, Musical Documentation [http://listserv.rediris.ed/archives/musicdoc.html] in Spanish. Must register online at [http://musicologia.uchile.cl/noticias.php3-]. Blog de la Musica Antigua de Chile: http://musicantiguaenchile.blogspot.com/2009/02/del-barroco-al-clasicismo-en-la-america.html – lists of ensembles, performers, discography, events, etc. Expotamia (Books and Music of Colombia): [www.expotamia.com/html/principal.html]. Universidad de los Andes: [sdiaz@uniandes.edu.co]. Universidad Nacional del Colombia: [www.unal.edu.co/paginas/directorio_bogota_nivel_administrativo.html]. AroCuba Web; Box 1054, Arlington, MA 02474l [acw@afrocubaweb.com]. Boledín de Coro: [www.voceintempore.org]. E-journal; no fee; has huge list of Mexican choirs and calendar of events. CENIDIM: [cenidim@correo.cnart.mx]. Government agency for the arts. Universidad Nacional Autónoma de México, library catalogue: [http://musicat.unam.mx/]. Has databases of music in the major cathedrals, as well as their own music catalogue. Fundación Coros del Perú: [www.corosdelperu.cjb.net]. Artícles, calendar of events, directory. Pontificia Universidad Católica del Perú, Centro de Estudios, Investigación y Difusión de la Música Latinomericana: [www.pucp.edu.pe]. Coral Director Antonio Paz Meneses; lists of conferences, seminars; online catalog of the Convent San Antonio de Abad in Cuzco, a very important archive. Schola Cantorum de Puerto Rico, Inc.: [www.hometown.aol.com/cantorumpr]. Choir that publishes significant amount of sacred and secular music. Music of Puerto Rico Foundation: [www.musicofpuertorico.com/index.htm]. Very informative with lyrics (in Spanish only), sound cliips, information about composers and artists, articles on genres. Sociedad Coral de Puerto Rico, Inc.: [http://hometown.aol.com/coral8000GAIN]. CEDOMM (Centro de Documentación Musical del Mercosur): [www.latinoamerica-musica.net]. Has e-periodical in English Portuguese, German, and Spanish with scholarly articles; also has many exceptional links. Centro de Documentación Musical Mercosur: [cedomm@adinet.com.uy]. INFORMACIÓN SOBRE MÚSICA, EL MUNDO LÍRICO Y BALLET EN EL URUGUAY: [www.puntoclasico.com]. Contains Del Uruguay.NET (reviews, recordings, news about many kinds of music); Charrua Web (interviews and information frrom Uruguayan composers). Biblioteca de la Escuela Universitaria de Música, Uruguay: [www.eumus.edu.uy/biblioteca/boletin/anio2003/nro1/boletineum.htm]. Scholarly e-periodical last week of each month. Fundación Vicente Emilio Sojo: [funves@reacciun.ve]. Research institute that also publishes music as well as music literature. VenezuelaCoral E-List – [venezuelacoral-admin@eListas.net] [venezuelacoral@eListas.net]. DECIAM-UVC: El Centro de Documentación e Investigaciones Acústico-Musicales de la Universidad Central de Venezuela. Coordinator Prof. Walter Quido. Purpopses: document music, bibliography, from inside and outside VEN about VEN music. To research and disseminate VEN music inside and outside VEN. To publish books, monographs, brochures, catalogs & essays on VEN and Lat Amer music. To edit com- positions by VEN composers. The collection will include the archives of Pedro Elías Gutiérrez, including books, music, periodicals, and other materials such as microfilms & audiovisual items. “Cantar,” [www.members.tripod.com/Cantar/bienvenidos.htm] site of Julio E.A. Cantarini. [capella@satlink.com] Features: Choral catalogue (1,207 original works, arrangements, collections, anthologies), links, choral library.